Dad was born in 1936 in Colchester as his father Tom Dovey was stationed in army barracks there at the time. Shortly after, the family relocated to Shropshire and Dad was raised in Sutton Maddock near Madeley. When Dad left school he held several forms of employment including coffin maker before commencing his stint in National Service. During this period Dad served in the Military Police and was mainly stationed in Germany. Upon leaving the army in the late 1950’s Dad joined the Police Force where he remained until the late 1960’s before successfully securing a job in what was then Wolverhampton Borough Council Finance Department based in the old Town Hall in North Street. Dad remained with the Council up until he retired in 1995. Dad had always held an ebullient interest in all things astronomical and the Wolverhampton Astronomical Society was first brought to his attention in approximately 1978 by his then colleague Frank Wildsmith who had himself attended meetings previously. 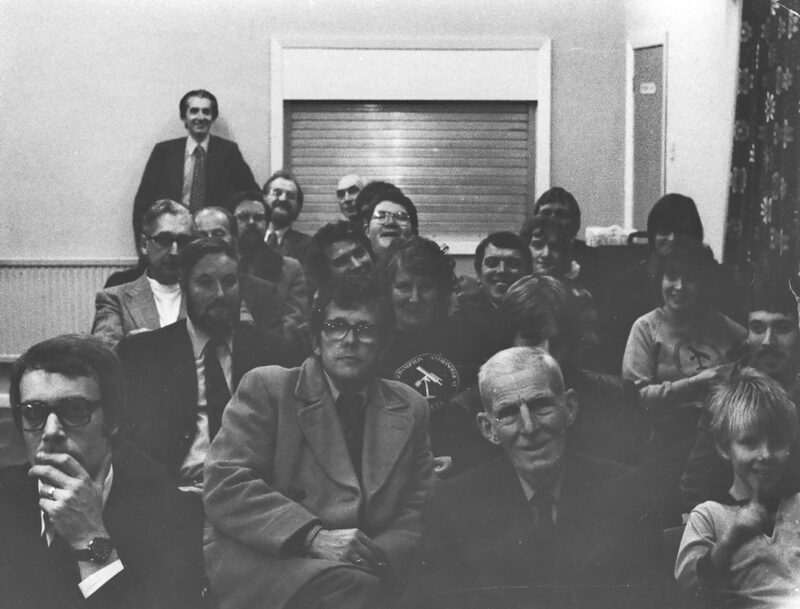 Dad became a firm fixture at meetings and went on many trips with the Society including a lecture delivered by none other than Patrick Moore in 1984 which I attended also; it would be a vast understatement to say that Dad was a little excited and overwhelmed by this event. Towards the end of Dad’s life it became more and more difficult for him to attend meetings but he continued to audit the Society’s financial accounts and although this was a more prosaic contribution compared to his involvement of previous years, I always knew that he was just happy to be contributing to the continuance of a group that was always close to his heart. 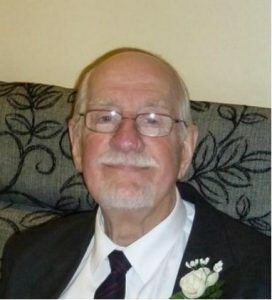 John was a stalwart member of the Society for many years, but like several others, was prevented from attending meetings on a regular basis in recent years due to health problems. However, as his son Jon has pointed out, in spite of that John continued to audit the Society accounts for many years. In 1983 John took delivery of the Society’s 9 inch reflecting telescope, intending to use it for observations from his house in Regis Road, Tettenhall. It was an old instrument, which required extensive work to return it to operation. Sadly, that never materialised, but at the same time it transpired that John was storing what was eventually shown to be a valuable and historic instrument, which has now been moved to a new secure storage location. Jon’s remembrance of his father reminded me of a photograph (see below) in the Society archive, dating from our meetings in Beckminster Church Hall. John is shown in the photo seated to the left on the back row, with his friend and colleague Frank Wildsmith seated next to him on the right. Another former work colleague, Malcolm Astley, is seen standing at the rear. One or two other past and present members can be seen in the photograph, which possibly dates from the early 1980s. Another point of interest is that the first version of clothing incorporating the then Society logo can be seen being worn, something which has become of interest again at the present time. John Dovey at Beckminster, back row on the left.